Delayed coverage on Red Button from 22:00 GMT & iPlayer for 7 days. That's all from Cardiff, hope you enjoyed the coverage of the 60th BBC Cymru Wales Sports Personality of the Year awards. available for seven days on iPlayer. Geraint Thomas tweets: Super happy to win Welsh SPOTY!! Thanks so much for all those that voted and your support throughout the year!!! He may have not made the top three, but Gareth Bale is in good cheer on twitter. He tweets: Congratulations @GeraintThomas86 !! Great to see a fellow Whitchurch High School pupil win #WSA2014. And how did Gareth watch the awards? On the BBC Sport Wales Online stream of course. Lee Evans tweets: @ManonCarpenter should have won, but well done none the less! And Ceri simply tweets: @ManonCarpenter - robbed. That's all the awards given out folks, so thanks for reading and hope you all enjoyed the show. 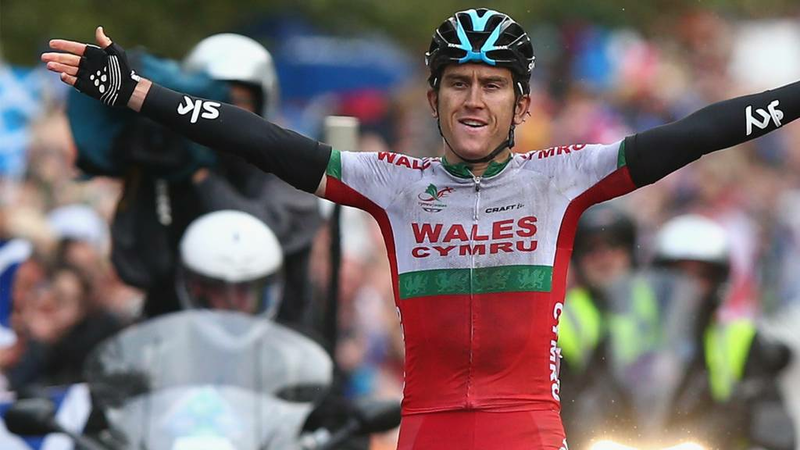 But send in any reaction you've got to the evening - is Geraint Thomas a worthy winner or do you feel someone else was more deserving? Unfortunately Geraint can't accept the award in person as he's away at a training camp, but by video link he's handed the trophy by Sir Bradley Wiggins with the comment, "I don't know why he hasn't won it before". Geraint's acceptance speech is short but heartfelt: "I don't know what to say. You look at all the previous winners - Ryan Giggs, Mark Hughes, Colin Jackson, Tanni Grey-Thompson - all household names. "I just want to say a massive thanks to all who voted and all those who've supported me throughout the year. The Welsh flag is one of the ones you see the most now on the roadside during races, and it was just fantastic to cap that off in Glasgow in a Welsh jersey - which I don't get to wear that often." Guto Shon Edwards tweets: @BBCWalesSport @BBCCymruWales @GeraintThomas86 Well deserved winner Geraint. You had a brilliant year. Byron Flynn tweets: @GeraintThomas86 Now for what we asked for in the Summer...Sir GT. Geraint Thomas: The people's champion? So, Geraint Thomas is BBC Wales Sports Personality of the Year 2014. Agree? Disagree? Who would you have chosen? Tweet #WSA2014 or text 81012 and get involved. Here we go, drum roll please maestro.... Lynn Davies has the envelope in his hand, and the winner is... Geraint Thomas! Congratulations to the 28-year-old cyclist, who went straight from his highest-placed finish in the Tour de France to the Commonwealth Games. In Glasgow he won a bronze in the Time Trial and then claimed gold in the Road Race in dramatic fashion - overcoming a late puncture and a wheel change to cross the finish line first. Second place goes to gymnast Frankie Jones, with third place to another cyclist - mountain bike specialist Manon Carpenter. Just the big one to go now, so time for a quick recap of the 10 nominees for Wales Sports Personality 2014. Their achievements are flashed on screen, but you lot can scroll down towards the bottom of this page for our little potted histories of each contender's successes this year. For those who are finding it difficult to remember Jo Coombs' contribution to Welsh sport this year, here is the moment that she masterminded Team Wales' first major success of Glasgow 2014 - when rhythmic gymnast Frankie Jones was awarded gold. Coombs is on the left, while Frankie Jones is being embraced by Carwyn James winner Laura Halford. Frankie Jones is up on stage to hand over the penultimate award, could that be a clue to the winner? Yes, it's Jo Coombs, who led the Welsh rhythmic gymnastics squad to eight medals at the 2014 Commonwealth Games in Glasgow. Will we see Frankie returning to collect the final award of the night for herself? Welsh para-cyclist (and SPOTY nominee) Rachel James is on-stage, handing Paul Jenkins his award for Coach to Disabled People of the Year. James tells BBC Wales' Jason Mohammad that she is looking forward to a successful 2015, especially in the March World Championships: "Hopefully we can replicate last year, then after that looking forward to Rio 2016... hopefully." Snooker loopy nuts are we, as the award goes to green baize legend Terry Griffiths. Quite a background has our Terry, who is a former postman, insurance salesman, miner and bus conductor who had a long amateur career, winning the Welsh Amateur Championship in 1975 and the English Amateur Championship in 1977 and 1978 before turning professional. He won the World Championship in 1979 at the first attempt and reached the 1988 final. He also won the Masters in 1980 and the UK Championship in 1982, to complete snooker's triple crown. Since his playing days Terry has become one of the leading coaches in the game. Paul Jenkins is the man honoured after leading the British Invictus Games wheelchair rugby team to gold alongside his work with the South Wales Pirates club. With an hour gone, we are getting closer and closer to finding out this year's Welsh Sports Personality of the Year. Who are you backing? Let us know via #WSA2014, or text us on 81012. New WRU chairman and former Wales and Lions fly-half Gareth Davies is up on stage to give the next award. And it goes to Taffs Well RFC's Donna Marshall for work that includes giving young people with autism opportunities to play the game. Welsh boxing great Colin Jones hands over the trophy to Terry and can't resist a little jab as he jokes: "He had a reputation as a bit of a dirty fighter, but he's cleaned up his act now!" The award is given to Swansea boxing stalwart Terry Grey. He took over the running of the Gwent Amateur Boxing Club in 1971 and has built a thriving boxing and sport venue in one of Wales' most deprived communities. The club has produced more than 30 British champions in its time and helped change the lives of hundreds of others. Laura Halford (left) and David Omoregie collect their Carwyn James awards from motorcyclist (and SPOTY nominee) Manon Carpenter - would you have chosen someone else for the youth awards? Tweet #WSA2014 or text 81012 and let us know. Mountain biker Manon Carpenter is interviewed by our Claire in the audience and reveals the secret of her success - her dad never allowed her to have stabilisers on her first bikes. Yikes! Team Wales captain Aled Sion Davies tweets: Congratulations @TeamWales on winning 'Team of the Year' at the #WSA2014. Huge honour to have been a part & lead Wales' most successful team. this link for a look at all the former winners - some great names and great memories. Caitlin from Cardiff tweets: Good Luck @GeraintThomas86 at the #WSA2014 awards tonight!! Hope my increase in phone bill will help the cause! Next is the award for the most promising young male and female athletes. The panel obviously agrees with Lynn Davies, as the Young Sportsman of the Year prize is given to David Omoregie. The 19-year-old 110m hurdler won bronze at the World Junior Championships in July 2014 in a time of 13.35 seconds. And it's Commonwealth Games rhythmic gymnast Laura Halford who wins the Young Sportswoman of the Year. After taking the Welsh and British senior titles earlier in the year the 18-year-old won three medals at Glasgow 2014. Lynn tips a young hurdler as the great hope for the next Welsh track and field Olympic medal: "Our best prospect is David Omoregie, he's the new Colin Jackson. Rio might be a little too early for him but I think he'll be in the team." Back to the awards and BBC Cymru Wales Director Rhodri Talfan Davies welcomes Newtown's Bill Marlow onto the stage, a former teacher who now dedicates his time to getting kids in Mid-Wales involved in orienteering. After winning the BBC Cymru Wales award, Bill will now go on to represent Wales in the UK final, which will be announced during BBC Sports Personality of the Year on BBC One Wales on Sunday, 14 December. Andrew from Richhill texts: Jamie Donaldson produced the standout moment of 2014 with THAT approach shot at the Ryder Cup. To be able to do that, under that much pressure and scrutiny is incredible. He gets my vote! Another logistical achievement is getting all those Commonwealth athletes up on stage who have attended tonight. "Leading it was something else and these guys just stepped up and delivered," says squad captain Aled Sion Davies of their Glasgow performances. Team Wales' swimming gold medalist Jazz Carlin tells BBC Radio Wales that the Commonwealth gold will always be a highlight for her: "Standing on top of the podium, seeing Welsh flags everywhere was definitely incredible. I'd love to capture that moment and remember it forever." We've just seen the best achievements of Welsh teams, so the prize goes to... Team Wales after their record 36-medal haul at the 2014 Commonwealth Games in Glasgow. Good luck fitting all those medals into the next video clip guys! A fantastic montage is playing on the big screens of some of Wales' sporting highs over the past 12 months. It really has been a great year. Get involved on twitter with #WSA2014 to join the discussion. Young Volunteer of the Year goes to Bridgend's Rhys Young for his work with the 5x60 Scheme, which aims to increase the number of secondary age pupils taking part in sport or physical activity. "Triathlon is growing all the time and I'm just proud to be up here on behalf of the sport," says Community Coach of the Year Royden Healey. Retired rhythmic gymnast Frankie Jones, who is nominated for the main prize tonight, tells BBC Radio Wales that all of the nominees inspire her - here she is pictured with fellow gymnast Laura Halford (left). Should Frankie Jones win tonight? Get involved with #WSA2014 on twitter, or text 81012. Next up on stage is triathlon coach Royden Healey, who is named Community Coach of the Year having given hundreds of young people the opportunity to try the sport. And it's Rhyl FC Academy coach Niall McGuinness who takes the Young Coach of the Year prize for boosting numbers and helping players make the step-up to professional clubs. Niall speaks of his passion for the work he does and says another Gareth Bale might be coming up through the ranks. Russell Slade is very interested at that - "You come and sit by me," says the Cardiff boss. The chair of Sport Wales Laura McAllister tells BBC Radio Wales' Simon Davies that #WSA2014 is "really special". BBC Wales presenter Claire Summers kicks off proceedings: "It really is a treat to see you all here this evening... sit back and relax as we reflect on the highs and the lows of the last 12 months." Cyclist Geraint Thomas became the first Welshman to win cycling gold at the Commonwealth Games, winning the road race after taking bronze in the time trial - all this after claiming his highest-placed finish in the gruelling Tour de France. Judoka Natalie Powell won Wales' first judo gold in the history of the Commonwealth Games and the 24-year-old also went on to win gold at the World Grand Prix in October. Rhythmic gymnast Frankie Jones won one gold and five silvers to become the most successful individual Welsh athlete at the Commonwealth Games. Wales' flag bearer at the opening ceremony, the 24-year-old then scooped the David Dixon award for outstanding athlete of the Games based on performance, fair play and overall team contribution. Non Evans, former rugby, judo, wrestling and weightlifting international, tells BBC Radio Wales' Simon Davies: "It's a diverse mix, but for the first time ever this year there's more women than men. For me as a female athlete, it makes me very proud to see so many women on this shortlist." She also found time to confirm her support for fellow judoka Natalie Powell, who became the first Welsh athlete to win Commonwealth judo gold. Should Powell win? Tweet #WSA2014 or text via 81012. Cyclist Rachel James won two para World Championships gold medals this year, piloting Sophie Thornhill to success in the tandem kilo and tandem sprint events in Mexico. James, who is sister of twice-world champion Becky, teamed up with Thornhill later in the year to pick up two more golds at the British National Track Championships. Golfer Jamie Donaldson struck the shot which won the Ryder Cup for Europe. The defeat of Keegan Bradley ensured Donaldson won three of his four games at Gleneagles despite the 38-year-old's rookie status. He had sealed a place in the Ryder Cup team with victory in the Czech Masters. Remember to include your name and location. Swimmer Georgia Davies won silver in the 100m backstroke at Glasgow 2014 before the 23-year-old won gold in the 50m backstroke. Mountain bike specialist Manon Carpenter won the Mountain Biking Downhill World Cup series and the 21-year-old was gold medallist at the Mountain Bike Downhill World Championships. Jazz Carlin struck gold for Wales at the Commonwealth Games.Image caption: Jazz Carlin struck gold for Wales at the Commonwealth Games. Swimmer Jazz Carlin picked up two golds in the European Long Course Championships, then the 24-year-old became the first Welsh female swimmer for 40 years to win aquatics gold in the Commonwealth Games in the 800m freestyle, followed by silver in the 400m the next day. Cyclist Elinor Barker has claimed team golds in the World and European Track championships, plus the World Cup and the Great Britain event, while at the Commonwealth Games in Glasgow the 20-year-old won a bronze and silver medal individually. Footballer Gareth Bale became the first Welshman to score in a Champions League final. The 25-year-old also scored the winning goal in the Copa del Rey final against Barcelona and the world's most expensive player has been a key part in all of Wales' qualifiers so far for Euro 2016. BBC Radio Wales Sport reporter Aly Rowell has reports of minor "mayhem" around the canapés. Nice to see the Welsh sports men and women refuelling with gusto. Leigh Halfpenny won the Wales Sports Personality award last year, so before the ceremony proper all kicks off about 19:30 GMT we'll recap the 10 runners and riders (other sports also included!) that you lot out there voted for. Team Wales' captain for Glasgow 2014 Aled Sion Davies tweets: On my way to the @BBCWales #WSA2014, best of luck to everyone. Over the next hour and a half or so we'll recap a stellar year of sporting achievement by Welsh athletes and see some worthy award winners crowned, both for sporting excellence and for services rendered. Hello to you all on this chilly Monday night and welcome to some warming live coverage of the BBC Cymru Wales Sports Personality 2014 awards ceremony from the Welsh Institute of Sport in Cardiff. And the same goes if you're on Twitter. Let us know what you think, and who you are and where you're Tweeting from. Whether you're at home or Christmas shopping - do let us know what you think. Remember to include your name and where you are.